International Socialism [London] was originally published in 1958 as a duplicated theoretical magazine by the Socialist Review Group then working in the Labour Party. After one issue in that format the following two numbers were produced in 1959 as a joint issue in the form of a book length study of Rosa Luxemburg by Tony Cliff. In 1960 the journal resumed publication, this time in printed form, with an editorial board drawn from a variety of tendencies but retaining its link with the SRG, which became the International Socialists in 1962. 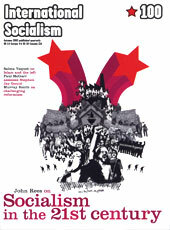 The International Socialists were renamed the Socialist Workers Party 1977 and the magazine ceased publication in this format at the beginning of 1978 (No.104) and was replaced by a book-format journal, which retained the name International Socialism but restarted the numbering, and a monthly magazine called Socialist Review. The first paper of the Russian Social Democracy in Russia, it was also illegal. It was founded by V. I. Lenin in 1900, and played a decisive role in the formation of a revolutionary Marxist party of the working class in Russia. Iskra's first issue appeared in Leipzig in December 1900, the following issues being brought out in Munich, and then beginning with July 1902 -- in London, and after the spring of 1903 -- in Geneva. The first editorial board of Iskra, along with Lenin, held five future Mensheviks: Plekhanov, Martov, Axelrod, Potresov and Vera Zasulich. On Lenin's initiative, the editorial staff drew up a draft of the Party's Programme (published in Iskra No. 21), and prepared the Second Congress of the R.S.D.L.P.. Soon after the Second Congress, the Mensheviks, supported by Plekhanov, won control of Iskra, beginning with issue No. 52.